Image credit: X-Ray Audio. Image courtesy Stephen Coates with Paul Heartfield. Wrap up warm and grab a Molotov cocktail at our Cold War Bar to celebrate the launch of This Mortal Coil, an exhibition and events season exploring representations of death and the macabre. 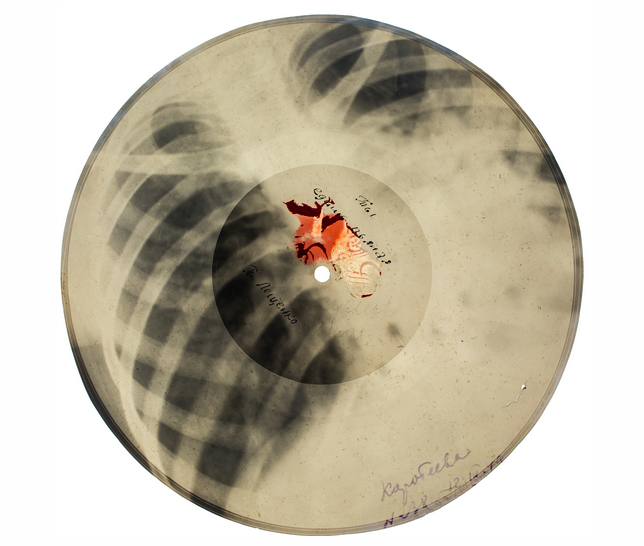 For Digbeth First Friday we are delighted to present X-Ray Audio: Forbidden Soviet Music ‘On The Bone’, an expanded exhibition developed for Birmingham bringing together original Soviet-era X-Ray plates obtained from hospitals and engraved with the grooves of forbidden and copied gramophone discs, with interview footage of bootleggers, new moving image works and ephemera. Posted in Friday 6 November 2015Bookmark the permalink.